Strengthening traditional academic models with proven business success strategies, Garrison Wynn, author of “The Real Truth about Success” delivers research results from what the top 1% in 323 organizations and 21 industries do that make them so successful. Get Ready!! 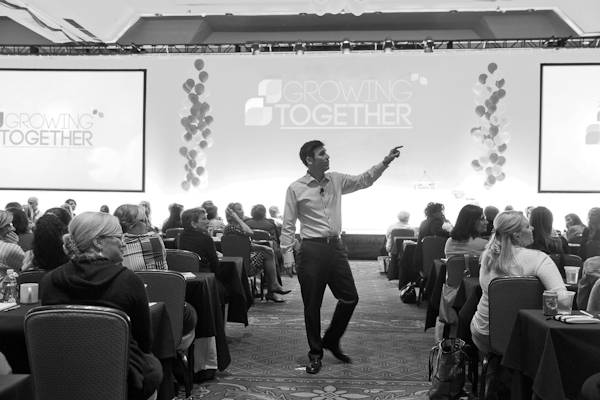 Garrison’s Keynotes are high-energy, engaging and very entertaining with detailed strategies that your organization can employ tomorrow! Garrison is simply a rock star! His ability to deliver a well-prepared message in a funny, interesting way and engage everyone in the room is unparalleled in his industry. His research and thought-provoking educational material will resonate with our organization for many years. You know you had a successful session when days later people start a discussion with “As Garrison said”. Probably the toughest gig, is the 8:45 AM motivational speech to kick off a Conference. You really did a good job to keep everyone laughing; they were all paying attention and wanted to hear what you had to say next. I have received numerous positive comments about your Keynote Address. Garrison your program was outstanding! You received exceptional reviews from our discerning faculty. Delivering a strong message with great take-away information in a very humorous manner was exactly what we needed. You ended our conference on a very positive, upbeat, and entertaining note. Schools are much more than workplaces, but that doesn’t keep office-style interactions out of the environment. Sometimes egos or cultures clash among co-workers, and knowing parameters for handling conflicts is important to every member of the team. In Wynn’s research, he has discovered time and again how our assumptions shape of our relationships. These self-limiting thoughts can narrow our vision and reduce the impact of the knowledge and experience we pass along. People who make others feel heard are trusted quickly. Those who can’t even pretend to listen may struggle indefinitely and wind up having little influence. One of the keys to success as a communicator is being present in the moment. Is every member of your team really focused on how others feel and think? How easy is it to get caught up in a single world-view? Wynn understands that open lines of communication often require establishing some sort of process for airing opinions and sharing ideas. But it’s not that hard to motivate your team to sharing. Once that wall falls, your organization can reap the benefits of a shared vision established on common ground. Garrison wynn’s keynote descriptions and speaker outlines for educational conferences, academic conferences and teacher conferences. This fun, comprehensive program offers tools and tips for getting through big change with very little stress. More importantly, it creates an emotional shift for attendees as they see how much control they have over how change affects them. This session also shows attendees how stress is more about what we believe than it is about what is actually happening. From embracing big transitions in technology to dealing with curriculum changes, student poverty, and family factors, this presentation helps superintendents, principles, and teachers implement necessary changes with minimal resistance. Give students knowledge and they’ll pass the exam, the course, the grade. But teach them to think, and you’ve equipped them with a powerful tool to carry them through life. The best educators share one strong belief: We don’t want to just transfer our ideas onto students; we want to enable them to generate their own ideas and solutions. This entertaining, insightful keynote examines the need to strike that tricky balance between teaching so students make the grade and teaching so they make it in life. Faculty and administrators must be on the same page regarding what that balance looks like and how it fits into the group mission. To get there, they’ll need the kind of influence it takes to get buy-in from busy peers, as well as the attention of time-pressed, socially stressed students. Garrison Wynn’s seen it all in his travels, from global companies looking to improve internal and external relationships to organizations just trying to get people to be more tolerant of each other’s ideas and beliefs. Getting your team members on the same page can be a daunting task. In the educational arena, it’s downright critical to maintain a productive environment with diverse workforces. Budget cuts. Unstable class sizes. Adapting to necessary changes is a challenge for administrators, principals and teachers. Garrison Wynn has more than two decades experience helping agencies weather ground-shaking transitions. He brings a research-driven, results-oriented approach to strategies for change management. Accepting the necessity of change is a critical ingredient of any transition. All members of an organization must understand that that all institutions must adapt and change before any progress can be made implementing new strategies. But even in the best circumstances, our natural reaction to change is resistance. Wynn finds there's no better way to minimize resistance to change than to ensure everyone gets involved, from those responsible for implementing a change to those affected by it. When people feel they are valued participants in planning and implementing a new course of action, they are more likely to follow it through. Knowledge is not necessarily power and processes aren't the key to success. Real solutions are much simpler. They are based on learning to minimize what you do poorly and a sharpening focus on what you do well. Any member of an educational team can help motivate his or her peers, but research shows that top-level involvement is the greatest contributor to success during any change. If people don't know "what" the change is and "why" it's here, then "how" to implement a policy shift or new strategy is a moot point. Leaders during a transition must back their words with behaviors and actions that support change. This extremely informative, entertaining, solutions-based session explores why younger and older people don’t see eye to eye. From dealing with coworkers and parents of a different generation to handling the entitled behavior of the students without losing your mind, this research-based program shows it’s possible for baby boomers and Gen X and Y individuals to work well together in an educational environment. Sometimes your most headstrong students possess the greatest talent. Sometimes the most demanding organizations to work with provide your greatest source of funding. And sometimes your most difficult colleagues are the least relevant in the classroom but the most significant in academia. Changes and challenges abound in education today. To survive them, faculty and administrators need influence and unity more than anything else. Without these, it’s a struggle to navigate difficult situations without compromising the extraordinary education you deliver to students. With characteristic wit, research and keen insight, Garrison Wynn explains how top educators build their influence so they can create and maintain unity in challenging times. He also offers practical pointers for dealing with the difficult personalities all educators face. Wynn’s understanding of how to be influential, especially in tough times, helps your organization move past fractious people and problems to retain unity and focus. Budget cuts. Unstable class sizes. Adapting to necessary changes is a challenge for administrators, principals, and teachers. Garrison Wynn has more than two decades experience helping agencies weather ground-shaking transitions. He brings a research-driven, results-oriented approach to leadership strategies for change management. Wynn focuses on the difference between managing people and leading them to be responsible, empowered and confident contributors. People need to know their contribution to an institution’s success. It is the baseline of effective leadership and the key to productivity to inspire commitment to the mission and let teachers know they are essential to the entire school’s success. How can you instill a climate of ownership so that everyone feels accountable and responsible for success? How can you motivate your team to focus on the goal rather than themselves? How can you help create an organization where change and innovation are embraced with courage and respected as a tool to beat the competition? Great leadership requires developing a shared vision that everyone can get behind. The result is a more productive and efficient workplace with superior morale that can rapidly overcome challenges in a competitive environment. Why Choose Garrison Wynn For Your Next Conference For Educators? Garrison Wynn didn't major in business while attending Emory University in the 1980s, yet he found his knack for disarming his colleagues with humor served him perfectly in a corporate setting. After consulting during a number of stressful mergers and image overhauls for the likes of AT&T and Texaco, Wynn embarked on his own venture–serving as a speaker, trainer and advisor to organizations enduring changing times. He even served as an adjunct professor of for the University of Houston. His work led him to seek out top professionals across in 323 organizations and 21 industries. He wanted to know what the top 1% do that makes them so successful. Armed with that knowledge, Wynn seeks to help execs and employees alike realize how to raise their personal bars. He's delivered his message in technical, educational, financial and industrial environments, as well as the entertainment industry. Experienced in working with both large and small organizations, Wynn is able to identify and synthesize organizational needs for quick, comprehensive change. He begins by helping institutions reduce complex issues to simple and easily understandable forms so that organizations can tackle problems in stages. The goal is to establish winning solutions that endure long after Wynn has left the stage. The process involves engaging all of an organization's members to find techniques for combating the daily complications all institutions face. Wynn's conducted workshops and seminars on building trust, getting results from difficult people, improving communications between men and women, and reducing the fear of failure in such diverse industries as hospitality, oil exploration, insurance and local government. He's also assisted small businesses to develop strategies for supporting business growth by resolving issues and implement techniques that allow professional and personal progress.